Mitchell Memorial Library has several technology-enhanced spaces available for instructors or group leaders to reserve for lectures, class meetings, workshops, and special events. ELI and Giles are the two electronic classrooms that faculty, staff and students can reserve to hold lectures and class meetings. They can be booked separately for groups of 30 or fewer, or combined into a single room for larger groups. Location: Mitchell Memorial Library, 1st Floor. Capacity: 30 people per room. Capacity: 24 people at computers with up to 48 sharing computers. The Auditorium is a large presentation space used for classes and special events. For more information about the rooms, including equipment and furnishings, or to reserve a room, visit the Reserve A Room page. Mitchell Memorial Library has 7 group study rooms, designed to provide quiet study spaces for two or more people. These rooms are freely available for use whenever the Library is open. All rooms have tables, chairs, white boards, power, networking and wireless network access for laptops. Two of the rooms are equipped with 42" flat screens with laptop ports. Check out dry erase markers and laptop cords at the Access Services desk. For policies and room locations, see the Group Study Room page. Specifically designed for presenters, the room is frequently used for organizational meetings, interviews, dissertation defenses, and class meetings, and by students practicing class presentations. The new technology-enhanced room is intended for academic and research group work/projects or meetings requiring technology. Location: Mitchell Memorial Library, 2nd Floor, in the Digital Media Center. Presentation Room 3060 is a technology-equipped presentation / meeting room, intended for academic and research group work/projects or meetings requiring technology. 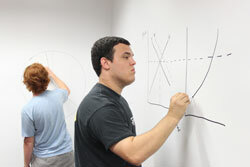 Features three whiteboard walls, perfect for brainstorming. Location: Mitchell Memorial Library, 3rd Floor. Need a little study fuel? 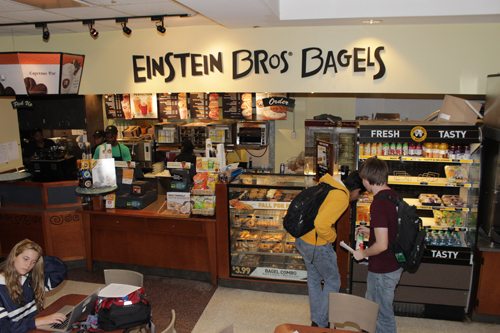 Einstein Bros. Bagels, located on the 2nd floor of Mitchell Memorial Library, offers coffee, bagels, salads, sandwiches, and more. See hours and menu information.